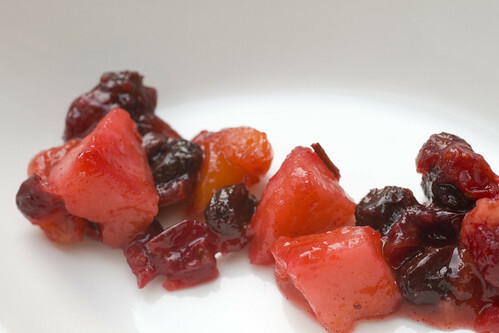 This dessert is all about making a Winter Fruit Compote, a super quick and easy recipe, using cranberries and dried fruit. You can then keep this deliciously sweet and tart compote in your fridge for up to a month. 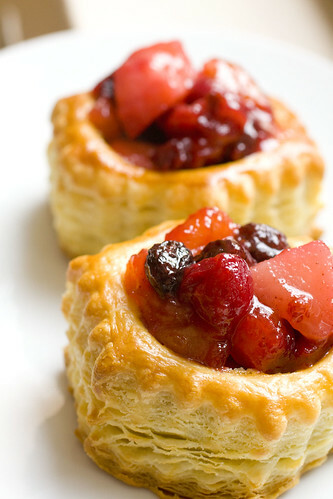 Any time you need a quick and easy dessert, you just pop as many or as little puff pastry shells in the oven as you want, and you’ve got an impressive and festive looking dessert. I think I’ll be using this one all through winter! 1. Place all of the ingredients except for the Grand Marnier in a large pan (12″ diameter, at least 3″ deep) on medium high heat and bring to a boil. Stir constantly as it thickens, until the tracks left by the spoon don’t fill immediately. Cook another 2 or 3 minutes. 2. Remove from heat and stir in Grand Marnier. Spoon into a large bowl and press a piece of plastic wrap onto the surface. Cool to room temperature. Store in an airtight container in the fridge for up to a month. Can be used cold, room temperature, or warmed. 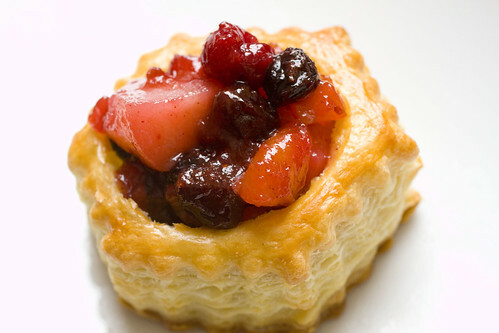 To make them into Winter Fruit Tarts, prepare puff pastry shells as directed on the box (egg wash and bake at 400 degrees until golden, 20-25 minutes). Allow them to cool for 5 minutes. Use a sharp pairing knife to cut along the circle. Remove the top and a little bit of the inside (and feed to husband). posted by jessica	at 06:28 PM	Filed under Desserts, Recipes. You can follow any responses to this entry through the RSS 2.0 feed. Both comments and pings are currently closed. 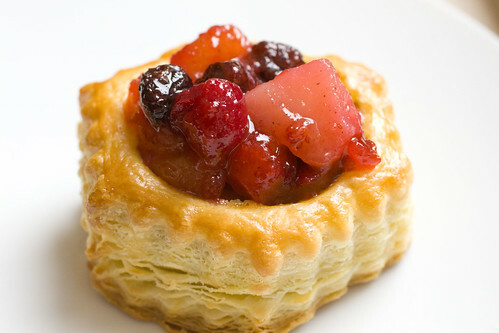 Great fruit tarts – as always! Dolce, Lon was hovering like a vulture. 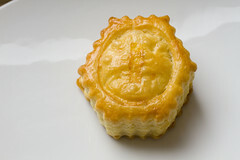 Kalyan, like I said, you can use the compote for many things so don’t worry if you can’t get puff pastry. 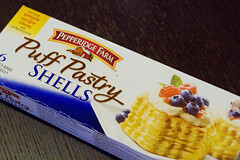 I love those puff pastry shells for both sweet & savory recipes! Great mixture of fruits here, scrumptious! 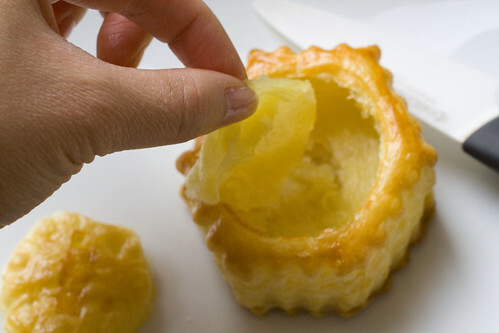 The puff pastry shells make it so much easier to do these types of things. Very elegant! These look so juicy and delicious, but also super simple. I love it! Looks perfect for a December wedding shower. THanks! Shar, please send us pics!